The majestic red and white-striped Assateague Lighthouse sits like a grand decoration on Chincoteague National Wildlife Refuge. Like the bald eagles of the same island, the lighthouse is perched guardedly on her land as if protecting a nest. However, the lighthouse not only watches over Assateague Island but keeps the maritime sojourner safe as it has done for 150 years. Its 142-foot stature and characteristic pattern make it impossible to miss when driving by. This is precisely what is supposed to happen. The coloring of a lighthouse, along with its particular pattern of flashing lights, is designed to make it highly visible to a boat in the adjacent ocean. In the old days, the lamp of the lighthouse was fueled by oil. The oil was stored in the oil shed at the bottom of the lighthouse. Every hour, the lighthouse keeper went up to the top with (2) five-gallon cans of oil to keep the light burning. There are a lot of steps to climb, 175 in all. With each step, you grow more and more empathetic to the fact that in days of old, the lighthouse keeper had a never ending series of ascents up and descents down those stairs. After all of that climbing, your reward is the beautiful panoramic view of Assateague Island, the beach, and nearby Chincoteague Island. It really is worth the effort! 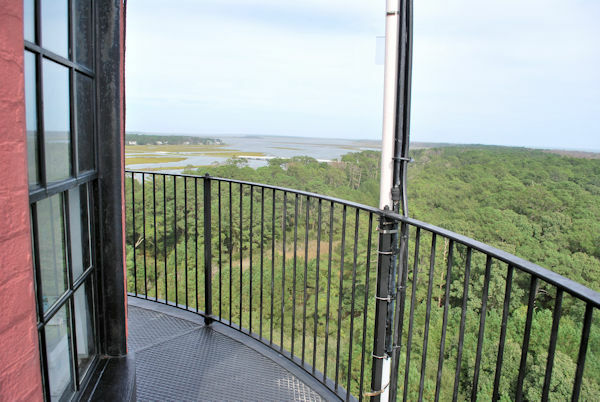 The Chincoteague Natural History Association (CNHA) is the non-profit group who makes the lighthouse accessible the public and also restores the lighthouse with donations made by visitors and members. For many years, the lighthouse was not open to the public but the good people of the CNHA raised funds to restore the lighthouse to current safety and historical preservation standards. The U.S. Fish and Wildlife Service owns the lighthouse and the Coast Guard is responsible for the functionality of the lighthouse. 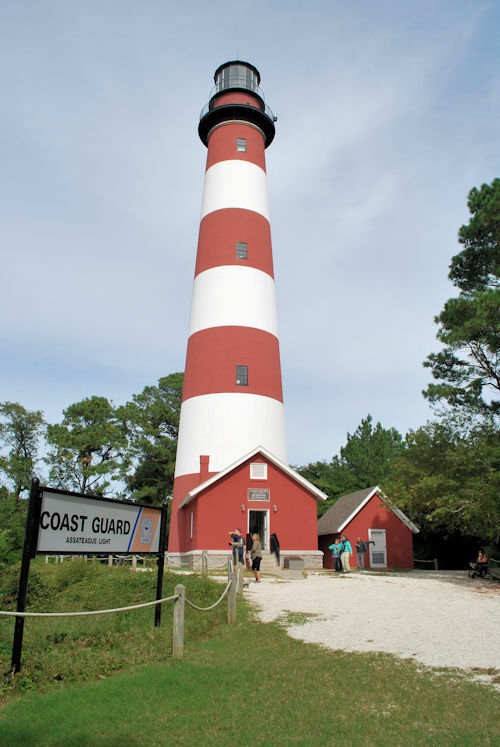 It is a functioning lighthouse that keeps maritime vessels safe in the waters off of Assateague. How much does it cost to visit the Assateague Lighthouse? Admission is free, however, they happily accept donations at the front desk located right as soon as you enter the door. When is the Assateague Lighthouse open? 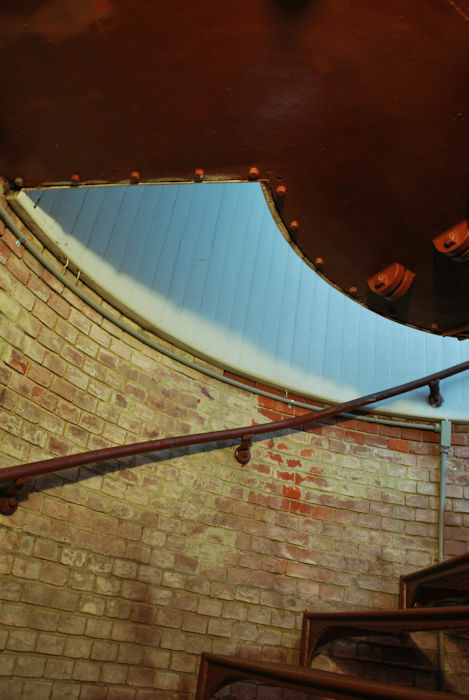 The lighthouse is open on weekends from April through November, between 9 am and 3 pm. If open, there is a sign at the parking lot stating the time that it’s open for that day. How do I get to the Lighthouse? 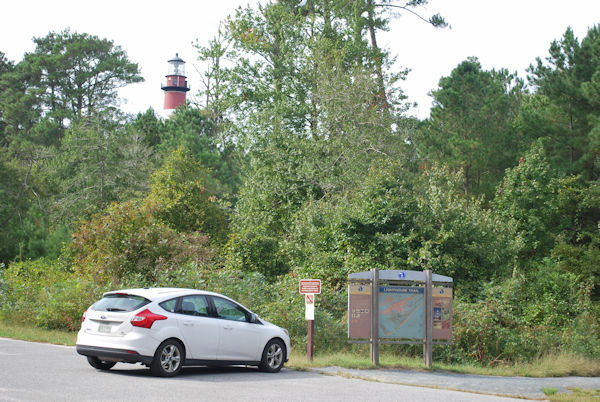 After you go through the main gate of Chincoteague National Wildlife Refuge, the parking lot is the first one on your right. Yes, but use caution. You’ll want to wear sneakers or comfortable, stable flat shoes or sandals, so nothing with a heel or slippery bottom. The steps are kind of steep, so be careful. There is a handrail on one side. The problem I ran into was sharing the hand rail with other people when they were going down and I was going up, or vice versa. If you know that someone is coming from the opposite direction, I’d suggest waiting at the nearest landing for them to pass you so that neither or you will have to let go of the handrail. If you are afraid of heights, use your own judgment. It is a pretty tall structure and you really sense the height at the top lookout area. Camera, donation money, bug spray and proper footwear are definite musts. There is a really lovely trail through the woods about a quarter mile long from the parking lot to the lighthouse. And it’s usually full of mosquitoes. Who shouldn’t attempt the lighthouse climb? It is physically difficult to climb the lighthouse, so I would consult your doctor if you are uncertain about whether to attempt the climb or not. Also, it is not handicap accessible. The lighthouse sits on top of a hill so there is some hiking involved from the parking lot to the lighthouse. I think that kids must be very careful climbing the lighthouse. If you can trust that they will hold onto the handrail and not try to run up the stairs, then they can probably handle it. My youngest were almost six-years-old when they first climbed. I hope you will enjoy the Assateague Lighthouse for its beauty and appreciate it’s purpose by planning for your own climb. For more ideas on Activities during your Island stay, please visit our website www.chincoteague.com. Whether it’s your first visit or you’re a returning guest, our site is there to help you plan your best trip yet. ~Sara and her husband Ted are the owners of Chincoteague.com. They are full-time residents of Chincoteague. They hope that their love of Chincoteague inspires everyone who visits their website to also visit their special island. Remember to visit www.chincoteague.com for everything you need to plan your next visit to Chincoteague Island. Marshfest – A festival that celebrates the Ecosystem, Craft Beer, Music and Art all for a good cause. Sara Daisey authors the Chincoteague.com Blog. She resides on Chincoteague Island with her husband Ted and three children, Garrett, Morgan, and Jenna.